Last fall I had the opportunity to watch yacht broker Garth Hichens drive a new Beneteau Sense sideways and then spin the boat 360 degrees within the tight confines of the City Dock in Annapolis. Last fall I had the opportunity to watch yacht broker Garth Hichens drive a new Beneteau Sense sideways and then spin the boat 360 degrees within the tight confines of the City Dock in Annapolis. A few days after that, I was out sailing on the Chesapeake Bay aboard another boat and had a chance to go head-to-head against the new Sense 46 and see how well it also does under sail. Years ago Beneteau pioneered the idea of packing in plenty of accommodation space aft and slipping snug sleeping arrangements into the “tweendeck,” until side-by-side double berth aft cabins became de rigeuer. When I stepped aboard the new Beneteau Sense 46, though, I found not even a pipe berth below the elegantly expansive cockpit. Clearly, in creating the Sense line—which now includes four different models ranging from 43ft to 55ft—Berret Racoupeau Yacht Design and the interior designers at Nauta Design have started with a clean slate and a free hand. Beneteau long ago refined an engineering approach that emphasizes manufacturing efficiency and customer satisfaction. Keel integrity, rudder reliability and chainplate security may not show off as well at boat shows as cabin accouterments, but builders in it for the long-haul know that effective engineering and quality are what really matter. 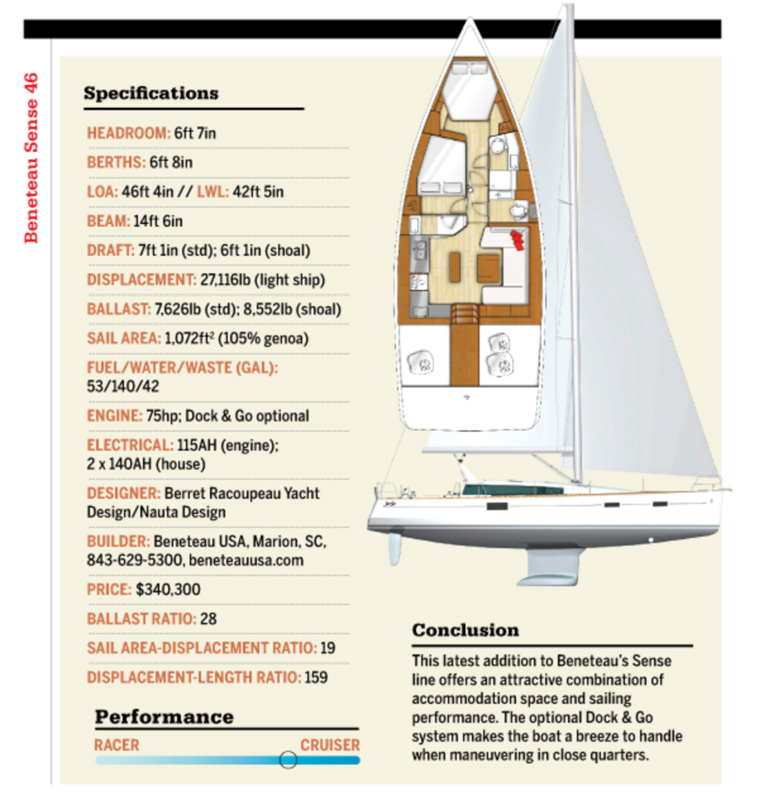 I see some cost-cutting in materials in the Sense 46—I would prefer lead ballast over iron, for example—but for a high-volume builder like Beneteau, price point is an important factor. 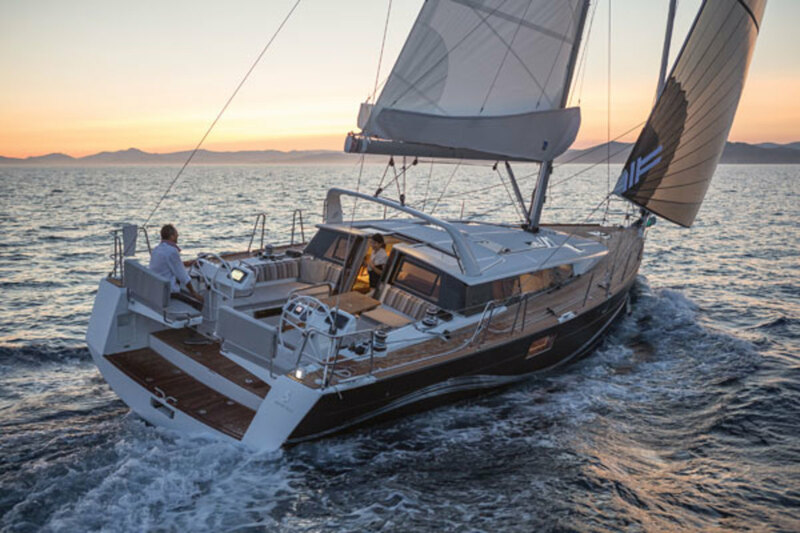 Beneteau follows a proven tradition in molding solid fiberglass hulls that include grids, liners and molded components to reinforce the single-skin laminate. The company’s signature method of installing bulkheads features molded liners with built-in bulkhead attachment slots, into which the veneered plywood bulkheads are lowered and then fastened with adhesive. Only when the interior is nearly complete is the deck lowered into place. Beneteau’s R&D efforts include an in-house lab and an engineering staff that evaluates resins, adhesives and sealants used in key structural aspects of their building process. Further labor savings stem from large-scale, computer-assisted design and manufacturing techniques in both the company’s French factory and its U.S. facility, in Marion, South Carolina. CAD drawings of interior components, for example, are used to robotically cut, sand and spray-finish a complete set of interior woodwork for each hull. 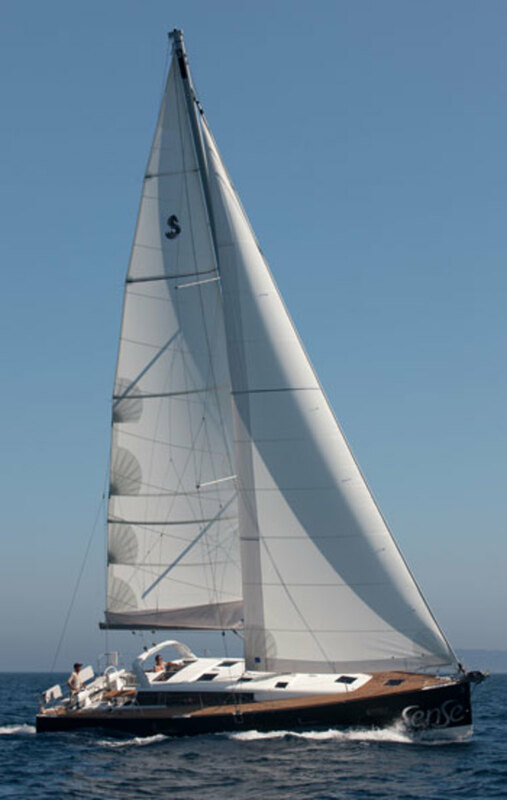 Despite being a monohull, the Sense 46 has the spacious, wide-open feel of a multihull, both in the cockpit and below: a wide-body approach to naval architecture that drives a number of secondary decisions, including the use of twin wheels and twin rudders. There are also a few hints of race boat technology—like plumb bows and chines aft—mixed with sensible cruising conveniences. The big sailplan is handled by in-mast roller-furling and a scattering of well-placed electric cockpit winches. These include an electric halyard winch coupled with a half-dozen rope clutches on the cabintrunk that allow a short-handed crew to set sail and reef while the off watch takes a snooze. 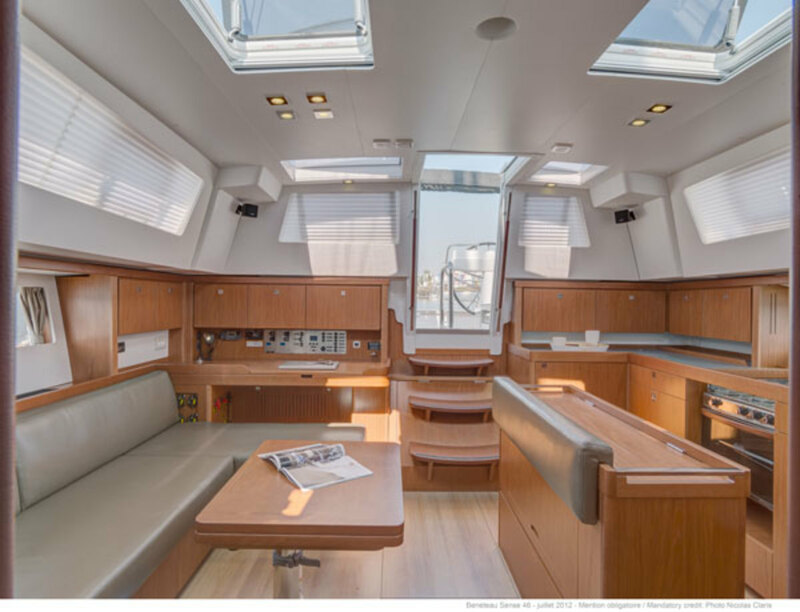 The open, almost patio-like feel of the cockpit, complete with a centerline table, makes it the place to gather, whether underway or in port. The twin helms are perched well aft and outboard to further open up the cockpit and make it possible to sit well outboard when driving to windward. The helm seats themselves fold up to create a clear pathway to the boat’s wide-open transom, which consists of a single step down from the cockpit sole, but is still at water level for swimming or boarding a dinghy. Add an inflatable kayak or two (which can be easily stowed in the big cockpit lockers) and kids as well as adults will be the envy of the local anchorage. Good use of amidships beam combined with a wealth of ports and hatches allows for a light, airy saloon and galley area. Abundant lockers—including a large pair under the cockpit sole—offer stowage space galore, and the two cabins forward of the mast boast spacious berths. Although the starboard settee and double berth in the port cabin are both viable options for sleeping underway, it’s clear that ocean voyaging is not the Sense 46’s primary mission. That said, the boat does have an ISO A rating for bluewater passagemaking. The inline galley is partially protected by an offset counter/bar that runs just to port of the centerline. This counter also gives the cook a point of support when working on a rough starboard tack. There’s a good stove, deep sinks, a top and side opening refrigerator, and enough counter space to make meal preparation an amicable experience. It’s all in keeping with the theme of style and comfort that drives this line of Beneteaus: a big boat that’s easy to get underway, easy to handle and meant for entertaining and casual cruising. As a sailor who likes short-handed cruising, I appreciated the streamlined sailhandling layout on this boat. The deck mimics the waterplane with a lean entry and beam carried all the way aft. The result is good form stability and sail-carrying power. A 6ft 1in shoal draft or 7ft 1in deep draft keel are available, and the latter isn’t excessive for a 46-footer. Those concerned about leeway and performance to windward should seriously consider the deeper version. I was surprised at how easily the big boat topped 6 knots in a 10-knot breeze, at which point the wide beam aft and hull chine seemed to lock the boat in place to minimize heeling. The advantage of having twin rudders became very clear as the breeze continued to build and the windward rudder started to lift out of the water. Steering remained smooth and easy throughout, and the boat resisted broaching even when clearly overpowered. Off the wind, a reinforced anchor roller affords a convenient tack point for an A-sail stowed in a snuffer. Another option is a gennaker-type reaching sail set and doused on an continuous-line furler. Bottom line: this is a big cruising boat that’s both responsive and fun to sail. The Volvo saildrive diesel delivers plenty of thrust and can push the boat to 7-plus knots in calm water without redlining the tachometer. The twin rudders deliver responsive steering in forward gear, even though there’s no prop wash over the blades. Going astern the boat was also quite controllable, even without calling on the magic of the Dock & Go system. One may argue about the cost, complexity and long-term care this system may require, but for those challenged by difficult docking conditions or those who call two a full crew, Dock & Go does deliver.